Built on the foundation of Enterprise 2. Designed for 'Dark Recording' environments. Remote management capabilities directly via the application interface. 5,000+ FPS throughput can be achieved on quality PC hardware. Records 'Direct-to-Disk' (Patented) No storage database required. Supports popular IP cameras and Video encoders. Stream / view / record multiple camera 'Groups' on each PC. Run multiple Groups on each PC… over 500 feeds per PC. Extensive fault tolerance. Failed connections reconnect automatically. Video feeds can be engaged at any FPS up to 30 FPS per channel. Available in a 5 FPS version (X5) at additional savings. Includes many supplemental applications at no extra cost. 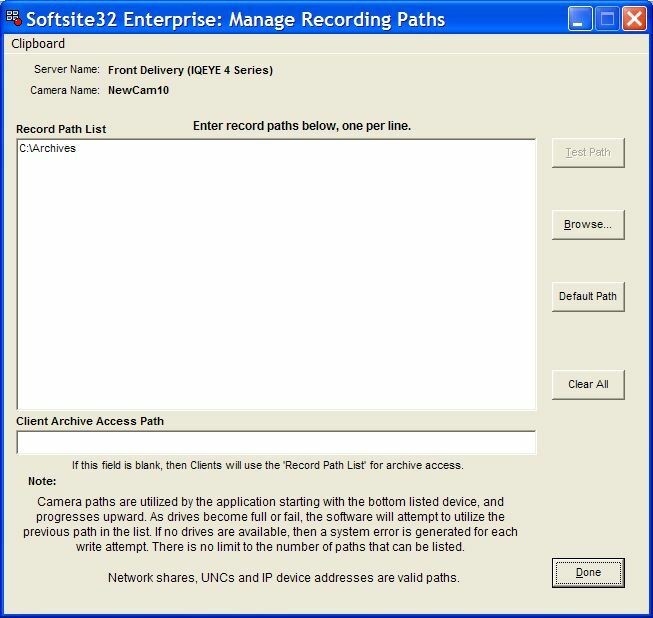 Softsite32 Enterprise 3 is a comprehensive Digital Video Surveillance Management System. Unlike DVR technology, NVR technology is software based and runs on all current versions MS Windows based computers. High-resolution video feeds are streamed digitally from IP based cameras and video servers. This allows the video sources to be located anywhere provided IP based connectivity can be established. NVR's require no special capture cards or hardware to function, and will run on most any current PC. Video is recorded digitally to generic computer disk drives with capacities from weeks to years' worth of instantly available, non-degrading video footage. Each frame is time stamped to sub-millisecond resolution and can be found with a few mouse clicks for hardcopy, review or export. Enterprise 3 can manage IP video resolutions of any size. Multiple Multi-mega pixel cameras can be streamed at full frame rate from standard PCs. Advanced features such as QuickView allow for ins tan an eo us, one click to the currently recorded frame of video. Also, a 24 hour overview of every camera's motion recording activity in a graphical representation allows an 'at a glance' view of all activity.